aka "What I Ate & What I Thought". Now in the South! 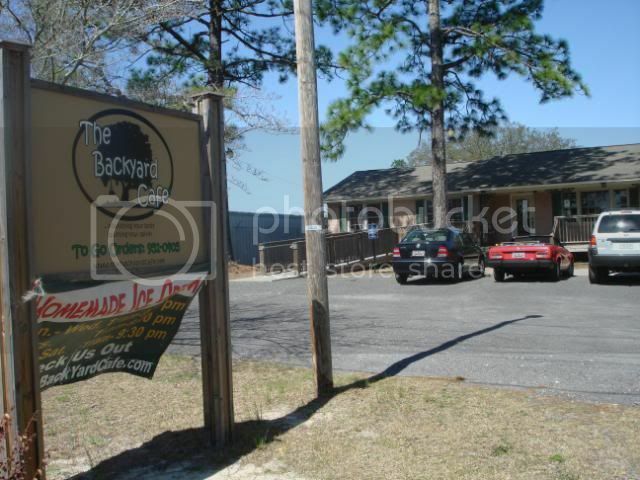 The tenth place on our cheeseburger crawl was The Backyard Cafe, a relatively new restaurant (by cheeseburger crawl standards - it only opened up in the last three years) in West Columbia. The first thing to note about this place is that it is really far away from the center of downtown Columbia, about a solid 20 minute drive...I really wish it was closer, because I would probably be going there much more often, but it is a bit far away for lunch if you want a quick bite to eat and you are in downtown. The second, more noticeable thing about this restaurant is that it is in a small converted one-story ranch house - basically, the outside still looks like a regular ol' house (and is in a residential neighborhood), but the inside walls were all knocked out to provide a homey locale for the Backyard Cafe. At the Backyard Cafe, they offer a whole bunch of other lunch dishes other than the burgers (including homemade ice cream, which is absolutely delicious, btw! ), but their burger menu is also pretty varied, with bacon cheeseburgers, chili cheeseburgers, and even a garden burger for vegetarians out there. They don't automatically put ketchup and mustard in the cheeseburgers though - a problem which lowered the scores of Flarké particularly. A couple of general comments about the cheeseburger: almost everyone who ate the burger (or other sandwiches) raved about their food. I ordered their pimento cheeseburger (pictured above), and thought it was the best I've had in Columbia so far - great quality meat, the patty and the burger bun were just big enough to make for a good-sized burger, without being too hard to eat (a problem I sometimes have with Pawley's Front Porch, but that is another post entirely, I suppose). They also provided a side of dill sauce, which added a great dimension of flavor to the cheeseburger which I liked. Andy excitedly commented: "Clearly, this is the best burger we've had so far - that's what a burger should be like." Bun: The bun was a regular white burger bun, not toasted. Meat: It was a thicker patty, nice grill marks, juicy, with a tasty, meaty flavor. Evidently they make handmade patties each day. Cheese: They have a good variety of cheese toppings - from cheddar to bleu cheese and a homemade pimento. 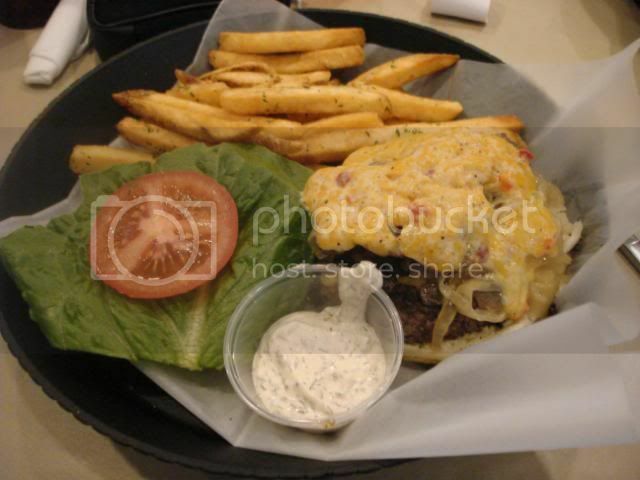 I lived the pimento cheese a lot - it was a really high quality cheese, lots of flavor, yet not too strong to be overpowering, and they melted the cheese well on the burger. Fries: Slightly thicker-cut steak fries; they were fried perfectly, salted just right. Presentation and condiments: Because this was a restaurant, they had a leg up on the presentation - a large, black plate for the burger. They did provide ketchup, but as Flarké noted, they didn't automatically put ketchup or mustard in the cheeseburger. For all of you that are reading this blog, feel free to make comments, and I will try to respond to it as timely as I am able. Please feel free to say whatever you want...because we all can, living here in the United States (yay First Amendment!). I do have comment moderation on (meaning I approve comments before they are posted) - not to screen comments out (even the hateful ones) - but mostly so I can screen out some of the spam that gets sent out of the internet (boo spam bots!). I will try to be respectful as I can about everyone's opinions in my reply comments, but please do the same for me as well! For me, food (and the taste of food) is very individual to each person. You may like some things which I don't like, and I may like other foods, and vice versa. I feel that everyone's culinary palate develops just a little bit differently based on their previous food experiences in their life, which colors what they believe tastes good and taste bad to them. Therefore, there really isn't any food dish which everyone in this world will find "good," despite some people's needs to declare it so. Since food is a very personal individualized experience for each person, I try to refrain from making too many statements like a food critic in this blog. I do try to keep some perspective though, and compare the quality and taste of food at any given restaurant to other restaurants of the same caliber and type. But, obviously, this site represents what I like/and may not like so much, but what I say is: if you might disagree, go and try it for yourself! =) If you are going to eat three square meals a day, you might as well enjoy it, right? P.S. If you want to know more about why I blog about food and about this blog itself, please read the intro. Thanks! Click on the photos for a much larger, more detailed, superior-sized photograph, and appreciate the food in all its pictorial glory. (Why Blogspot won't just let me use the original sized photograph that I uploaded, I have no idea) =P. I try not to take photos with flash, because that makes the food look really white, but that also means that some photos are sometimes a bit dim, depending on the mood lighting in a given restaurant. And yes, although it probably is obvious, I am a completely amateur photographer, taking photos with my trusty point-and-shoot Sony Cybershot or sometimes my cellphone camera when I forget my camera (it happens quite often, unfortunately).